I’m going to try and do a cookbook review every month. Remind me if I forget! 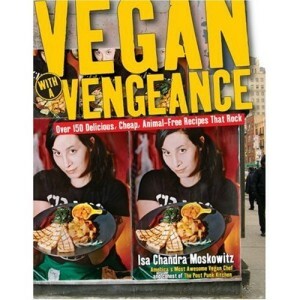 The first one I’m going to review is Vegan With a Vengeance by Isa Chandra Moskowitz. I love everything about this book. I love the style of writing, the recipes, the creativity, and the wide variety of ethnic influences. Obviously in any cookbook there will be some recipes that you don’t fancy trying, mostly because they use ingredients you don’t like or can’t get. I’m lucky enough to like everything but I haven’t got much of a sweet tooth. So I haven’t tried many of the sweet recipes, but I know that they all have millions of fans, so they must work too. Probably my favourite section is the breakfast chapter. Here in England it’s nigh on impossible to get decent vegan breakfasts so I’m always keen to make my own. Add to that the fact that Americans are so much better at breakfasts than we are, and this makes for an excellent chapter. The very first thing I tried from the book was the “Fronch Toast”, because I was a great fan of eggy bread in my non vegan days. As long as you don’t ignore the instruction to toast the bread first, it works perfectly and looks just like the real thing. As do all the recipes in the book! I’ve made probably more from this book than any single other cookbook and I’ve only had one disappointment -the chilli. But I’ve found out since that I probably used the wrong type of molasses, so I’ll try it again as I’m sure that accounted for the bitter taste that I didn’t like. Even ingredients I’m a bit suspicious of, such as quinoa, transform into miraculously tasty food when turned into Black Eye Bean and Quinoa Croquettes with Mushroom Sauce. I’m trying to pin down my absolute favourite dish from the book and I just can’t do it. They’re all brilliant for different reasons – I learnt that I could in fact make vegan crepes, that hijiki isn’t as scary as it looks, that millet is nicer than polenta, that risotto can work without parmesan, that pine nuts make a tasty alfredo sauce, that watercress is good for breakfast, and many many other essential vegan facts of life. Add to this the wonderfully helpful message boards over at Post Punk Kitchen and the useful collection of photos of finished recipes at Flickr, and you’ve got a complete package. If you’ve read this far and you don’t own this book, what on earth are you waiting for? And the even better news is that there’s a new book coming out in November! NB to UK readers. There is a UK version of the book, which I guess uses proper weights and measures rather than cups. I’ve got rather attached to my measuring cups so I use the US version. I’m also supposing that the new book will come out first as a US version, and I know I won’t be able to wait for the UK version. But if you don’t like the vagueness of cups and tablespoons, then buy the UK version and let me know how it is! This entry was posted in Review, VWAV by efcliz. Bookmark the permalink. Lovely review! I really enjoy your page set up and writing style! Keep up the good work!